Greenland precipitation a bit above average on 18th March and probably for next two days.. After that looks like staying pretty dry. But I'm posting this to show the pink extent in SW Greenland -the most extensive I've seen this year. DMI seems to be not showing this as melt, i.e. it is sublimation. Greenland precipitation a bit above average on 19th March and probably for next one or two days.. After that looks like staying pretty dry. But I'm posting this to show the pink extent in SW Greenland continues -the most extensive I've seen this year. DMI seems to be not showing this as melt, i.e. it is sublimation. Greenland precipitation continues its relentlessly average/below-average season, and looks like staying that way to the end of March. Then, GFs says that above zero temperatures will reach SW Greenland as the potential 5th Nor'Easter leaves North America bringing a mixture of snow and rain to Southern Greenland. This could cause the first measurable melting event of 2018. Not a lot of people know that. Not a good idea to talk about it - a very sensitive issue as yet unresolved (because no-one who resolves these issues has been told there is an issue). And where did they get that map? Below is what DMI produce, also accumulated SMB from Sep 1 2017 to now..
No, that is about colors of Dutch flag vs France flag vs Graph. OT as hell, sorry. "EU BROKEN BY GREENLAND DISPUTE"
The European Parliament descended into chaos and violence today when it became known that Ireland has sent an expeditionary force to attempt a fait accompli of sovereignity over Greenland. The UK government in a terse statement said " Now you know why we buggered off". Greenland surface mass gain still continues very much on the low side, and cci-reanalyzer again predicts low precipitation over the next few days. I will continue to cling to "my theory that belongs to me", i.e. that the decline in precipitation that started in November coincides with the onset and continuance of La Nina conditions and this is not a coincidence. I wonder if La Nina is associated with loads of snow elsewhere in the Northern Hemisphere. Hope I'm not repeating someone else's post. NSIDC Greenland is open for business - including a review of 2017 that seems to reflect the cool and cloudy summer in the rest of the Arctic - but note the late melt events. Extracts below. The site also has some new(?) links. ....The 2017 melt season was less intense than recent years, and was below average melt in the 1981 to 2010 reference period. Surface melting was particularly low in southeastern Greenland. In general, melting was limited to low elevations (below 1500 meters or 4900 feet) along the western and northeastern coastlines. Fewer melt days than average occurred along the Davis Strait and the interior melt pond region along the central western coast. As discussed below, the melt year ended with two significant late melt events in southeastern Greenland. The final 2017 melt event occurred at the end of October, covering the southeastern coast. Thank you for that post. Perhaps it will be a one-year anomaly, but I found the particularly low melt in SE Greenland rather intriguing. Unless I am mistaken, this has been an area of rather intense melting over the past decade, linked to warmer north Atlantic sea surface temperatures. This will be interesting to watch this year. the more costal ice has melted on the more higher ground the remaining ice is situated which may well slowdown melting speed, at least when it comes to the part that is measured from bird view. dunno enough how things are measured but this is what came to my mind. it means that if you look at aerial images it looks like less melting while volume loss could be continued while perhaps slower due to lower temps at higher elevations? this is meant as a question more than a statement, hoping for feedback to explain how things are officially/commonly measured. The changes in Greenland are not such that ice height is changed sufficiently to affect melting speed. And last year the volume loss from melting was indeed low compared to previous years. After the Sept / Oct large precipitation, Greenland surface mass gain still continues very much on the average to low side, and cci-reanalyzer again predicts low precipitation over the next few days, and once again mostly confined to the SE corner as yet another one or two lows come from the NE corner of North America, threatens rain on the coast and just dumps a bit of snow. The only melt so far is the odd day with a little bit of sublimation insufficient to show as statistically significant. The utterly average precipitation since October during this 2017-18 winter is the real oddity given the extreme abnormal events elsewhere in the Northern Hemisphere. An example of when nothing happening is as significant as something happening? Fairly accurate, except that the snow line was further south along the Atlantic coast, but that was largely based on a more southerly rain/snow line. Weaker La Ninas tend to push the snow further eastwards. From what I have read, La Ninas tend to have very little influence across Eurasia. More data for "The theory that belongs to me". Meanwhile Greenland precipitation continues in utter and complete averageness. After the Sept / Oct large precipitation, Greenland surface mass gain still continues very much on the average to low side, and cci-reanalyzer again predicts low precipitation over the next few days. Though for a change, after a few days precipitation (still low) will switch to the West Coast. A big change today (sarcasm). A bit of pink on the todayssmb map (sublimation) but insufficient to show as statistically significant. 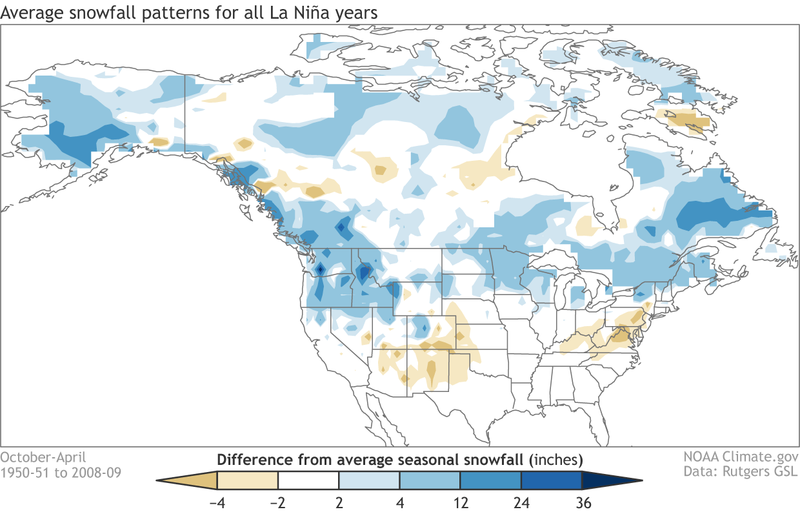 I wonder if La Nina is associated with loads of snow elsewhere in the Northern Hemisphere. After the Sept / Oct large precipitation, Greenland surface mass gain still continues very much on the average to low side. Cci-reanalyzer again predicts very low precipitation over the next five days at least and confined to the South-East quarter (see first image). Though for a change, after a few days precipitation (still very low) will also appear the West Coast. A big change (sarcasm) could happen on May 1st. A melting event !! (see second image). No sign of one before then. After the Sept / Oct large precipitation, Greenland surface mass gain still continues very much on the average to low side. It looks as if that low precipitation will continue to the weekend, but after that may return to average as lows do manage to get onto the Greenalnd mainland. A big change (sarcasm) could happen actually happen on 27-28 April. A melting event !! (see first image). No sign of one before then or after. Regarding upcoming melt, hit up earth Null School, select surface temp, and fast forward to the 27th. There are strong warm winds forecast to push into SW Greenland. While I have been wittering on about low precipitation and the only melting being a bit of sublimation I totally missed that there was a melting event for two or three days about a week ago. And yesterday 1% of Greenland had melting! And melting may still be happening today!! The first two images below illustrate the depth of my dumbness. After the Sept / Oct large precipitation, Greenland surface mass gain still continues very much on the average to low side. GFS seems to have changed its mind - very low precipitation for the next 10 days. I will continue to cling to "my theory that belongs to me", i.e. that the decline in precipitation that started in November coincides with the onset and continuance of La Nina conditions and this is not a coincidence. The utterly average precipitation since October during this 2017-18 winter is the real oddity given the extreme abnormal events elsewhere in the Northern Hemisphere. An example of when nothing happening is as significant as something happening? It is totally boring, but at least we now have the prospect of melting to speculate about. No wonder you missed it despite all your usual dilligence. That was a very early melt event. I hope it doesn't hope a high melt year. The heat and rain (snow on Greenland) moving up the Greenland Sea is messing up my precipitation theory but not providing a melt event. Later this week? Precipitation down again. This season of utter ordinaryness continues. Warmth that moved up the Greenland Sea and warmed temperatures North of 80 many degrees above normal had ZERO effect on mainland Greenland. The interesting non-event has been the total absence of a melting event since the third week of April. GFS seems to be saying that this absence of a melting event will continue for the next 10 days. Will there be a melting event on the W. Greenland coast in the next three days? The attached image is the 3-day maximum temperature from cci-reanalyzer. Use with care!! It shows the maximum temperature for each part of the map over the next three days - i.e. there will not be a period where the whole area of the map is at the temperature shown. Nevertheless, warmth will be travelling up Baffin Bay and it might be enough to make a large enough melt to register on the DMI images. A melting event ! A whole 1 percent of Greenland melting ! What is more, that warmth in Baffin Bay may melt a bit more of Greenland for part of the time over the next three days. Hold the Front Page AGAIN! A second day with a whole 1 percent of Greenland melting ! What is more, that warmth in Baffin Bay may be strengthening - meaning stronger melt of a bit more of Greenland for part of the time over the next three days. The warmth in Baffin Bay did strengthen - a little bit. 2% area melt for the last two days. Note this is below the average for the time of year. From cci-reanalyzer it looks like this could continue. A high pressure in Western Europe is sending Atlantic lows up north twixt Greenland and Scandinavia, and is likely to keep precipitation a bit above average on the south and east of Greenland. 2% area melt every day for over a week - and a little bit below average. From cci-reanalyzer it looks like this could continue. A high pressure in Western Europe is still sending Atlantic lows up north twixt Greenland and Scandinavia, and is likely to keep precipitation a bit above average on the south and east of Greenland. The utterly averageness of this season continues unabated. 2% area melt every day for over 10 days now - rising to the giddy heights of 3% on 24th May for one day only. This is below average. A high pressure in Western Europe is still sending Atlantic lows up north twixt Greenland and Scandinavia, and is likely to keep precipitation around average on the south and east of Greenland. From cci-reanalyzer it looks like this low melt and average precipitation could continue, in contrast to significant warming into the Arctic especially from Eurasia. Perhaps the cold over Canada is putting a damper on the melt. Especially around Nuuk. Above my pay grade - but in the next few days (<5) GFS says some real warmth is going to enter the NE quadrant of Canada- will it change the game? If the artic ocean proper melts the way it has been melting the last decade, and the Arctic weather reorganizes over the last big cold northern ice mass ( Greenland ) ( see Cold Temperature North Pole in http://eh2r.blogspot.com/2018/04/2018-annual-spring-summer-projection-by.html?m=1 ) then we should expect that Greenland might experience a reduce melting rate ? Above my pay grade - but in the next few days (<5) GFS says some real warmth is going to enter the NE quadrant of Canada and into Baffin Bay- will it change the game? NOT YET, but maybe a blip upwards in melt in the next three days. below average 3% melting continues, unremarkable precipitation continues. 3% area melt every day for about a week now. From cci-reanalyzer it looks like this low melt and average precipitation could continue, in contrast to significant warming into the Arctic elsewhere. If this continues the melt will be unusual for being persistently well below average. 3% area melt every day for about a week now. A jump to 4% on 30th May. From cci-reanalyzer it looks like maybe on 3rd June a significant part of S. Greenland will be above freezing. Maybe a significant melting event over the next few days? The models show a very consistent vigorously warm SE influx of relatively humid warm air pummelling the S half of GIS. With the freeze line steadily pushing upwards of 2500M for quite sometime. With the freeze line steadily pushing upwards of 2500M for quite some time. And for once, the reality may follow the models. 3+% area melt every day for over a week now. A jump to 4% on 30th May and to 5% 31 May. Precipitation mostly somewhat above average for the last few days. From cci-reanalyzer it still looks like a significant part of S. Greenland will be above freezing, and it also looks as if precipitation in the south will also be above average. Maybe some events in June at last? Not quite so intensely average and boring.. The Greenland melting season is waking up again. 3+% area melt every day for over a week now. A jump to 4% on 30th May, to 5% 31 May, and to 6% on 1st June. Precipitation mostly somewhat above average for the last few days and a significant spike on 1 June. It still looks like a significant part of S. Greenland will be above freezing, perhaps reaching a maximum on Wednesday or Thursday and it also looks as if precipitation in the south will also be above average. Looks like quite a bit of rain coming to S. Greenland from 2000M and below.